Irrigation supplies crops and other plants with necessary water and sometimes nutrients may be applied as well. In organic farming, conservation is important in irrigation practices, as is sustainability. 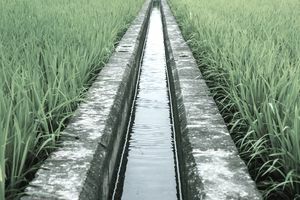 While you certainly can irrigate organic crops similar to conventional ones, be sure to also focus on overall water usage and other factors, such as energy usage, as you design an irrigation system for your . Although , growers should try their best to use an irrigation method that helps conserve water and energy. For example, a producer could use wastewater or a solar-powered irrigation system, which can save money, time and water. "Producers who irrigate in arid areas are more likely to use irrigation throughout the growing process (full irrigation), while producers in more humid areas may use irrigation to supplement rainfall and soil moisture under drought conditions." Drip systems deliver water to the roots of crops via low-pressure pumps at ground level or below the soil surface. Surface methods use gravity to move water across the land downhill, without a pump. Center-pivot systems, which require a pump, are where the water flows from a series of sprinklers located on towers with wheels. This type of irrigation is common on flat, large farms, and can irrigate a 130-acre area. Manual methods, which is only practical for very small farms, have workers move the water manually to the crops. Meanwhile, the water itself can come from the local water utility (assuming one is available), from on-site wells, from rainwater collection, or even from treated wastewater. Farmers need to protect their water source to make sure it's clean and to ensure there's enough to keep the crops healthy. tend to be smaller on average, and so their irrigation systems should match their scope. It's hard to beat the simplicity of manual irrigation for a tiny organic farm — you can add water when and where it's needed, and let the rain take care of the rest. But once your farm gets a bit bigger, you'll almost certainly need to consider alternatives to manual labor. Drip irrigation systems, in particular, may be well-matched to the needs of small organic farms. They require less water, and they allow the application of nutrients along with water to crops. Also, they require less energy, since the pumps used are low-power. However, drip irrigation may cost more to install — some estimates indicate they cost up to $1,200 per acre and they also may require more maintenance. Surface irrigation can also work well for organic farms, especially with closely spaced crops that feature deep roots. Some farms use renewable energy sources, such as a solar array or wind generators, to pump the water uphill to storage tanks, and then release the water and let gravity move it down the fields.